Senator Tom Coburn, a physician turned law-maker, predicted that hundreds of thousands will die from this outbreak of Ebola since the area of Africa most affected does not have the ability to deal with it. Attempts to contain the outbreak to specific villages, towns, cities, and countries have failed. More than 2,400 have died from the disease. Last Tuesday President Obama revealed plans to launch U.S. support to the West African regions of Sierra Leone, Guinea, and Liberia. This offensive involves sending thousands of U.S. military personnel to the outbreak epicenter for the purpose of establishing command-and-control centers along with new hospitals to assist in the battle. Having considerable experience travelling to and working in these areas, I can say that it simply can’t work under the current circumstances. Even if the U.S. takes mobile hospitals to set up MASH units, they can’t manage the overwhelming number of patients seeking care. To complicate matters, the treatments require weeks of rest and IV fluids, and they must be quarantined for that period of time. There is no such thing as a quick office visit. This is exhaustive supportive care that requires personnel and resources. In the midst of this, U.S. lawmakers have become increasingly concerned about the prospect of Ebola entering the country via air travel. This is easily understood by the following true example noted by CNN medical correspondent Dr. Sanjay Gupta. Patrick Sawyer, as U.S. citizen who had been working in Liberia became ill while flying to Nigeria earlier this month. He intended to return home to visit his family, but died before he could. He was hours away from bringing active Ebola into the United States because when he left Liberia he had no symptoms. Eventually, someone will innocently carry Ebola to our homeland, and although there is much we can do to prevent it including airport temperature screening, someone will get through. That does not mean we are doomed, for several reasons. Although Ebola is a very aggressive virus, those who have contracted it have been in direct contact with a person or corpse infected with the virus. There have been studies indicating that it may indeed be airborne, but as far as experience has displayed, this has not been the case in the field. We have a swift system for dealing with large outbreaks of viral epidemics—to a degree. 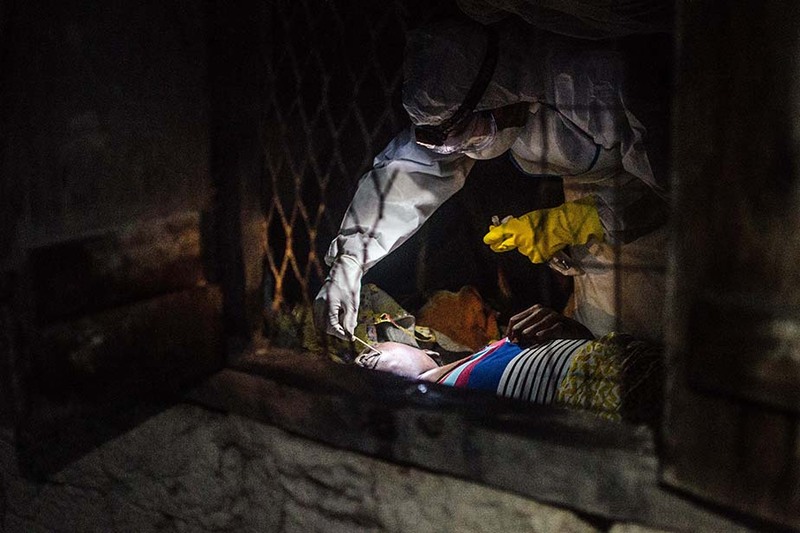 Currently the problem in Liberia and Sierra Leone is that anyone contracting illness is immediately avoided by others. They can’t even find medical care because it’s too scarce. Many ill patients are dropped off at the hospitals and aid centers as the vehicles speed away, leaving spouses, children, and friends to die in the street. There is no room for them inside. A subcommittee of the Senate Health Committee held a hearing on the outbreak last Tuesday. Some members of that panel feel that U.S. doctors need to spend more time on the front lines in West Africa. “This is an outbreak that needs our expertise to be on the ground for more than three or four days,” said Senator Chris Murphy. I don’t know how that is possible given the limited number of beds and isolation facilities available, even if the President sends the 3,000 troops he has promised, how do you hospitalize over 2,000 patients in strict isolation when there are only 250 beds? The problem is huge, and both democrats and republicans feel the response by our government is too little.